In 2008, on a parched July day in central Afghanistan, 26-year-old Sayed Ali Jan was at work, hauling fuel along a highway in Wardak province for a logistics company supplying foreign troops. His young wife, Sayeeda, was at home with his parents in Kabul. They were expecting their first baby before the end of the year. Then, suddenly, the plans that any young couple makes were over before they had really begun. A gunman on the road signaled for Sayed to stop: Taliban. Sayed hit the brakes and jumped down from the cab. It had been seven years since the U.S. led international forces into Afghanistan, and at that moment he was on the wrong side of an escalating war. The Taliban destroyed his truck in a fireball and took him captive. Two months later, Sayed escaped and walked for two harrowing days to get home, only to find that his wife had miscarried and his father had died of a heart attack. The Taliban were pursuing him, so he and his wife decided to flee the country. They sold the family home to raise $14,000  the price tag to be smuggled on an increasingly well-traveled route through Pakistan to Malaysia. There, they were kept in a hotel room for over a month where Sayeeda, pregnant again, delivered her daughter Kaienat with the help of a woman from the smuggling ring. The family boarded a small boat to Indonesia and eventually were left on the street in Jakarta, stripped of their passports, watches and phone. After making their way to the U.N., a local branch of Church World Service gave them about $125 to take Kaienat to the doctor and rent a one-room apartment in an area outside Jakarta already so full of asylum seekers that one aid worker calls it "the waiting place." But after two months, the U.N. office had yet to schedule their interview to apply for asylum, and the cash was running out. "If we knew, we would have stayed and died in Afghanistan," said Sayeeda in January. "Dead is better than this life." There are millions of people living that life today. They are scattered in sprawling tent cities, cramped apartments or jail cells, each one caught in a system struggling to keep pace with the complex world that put them there. According to the U.N., there were over 15 million recognized refugees around the world at the beginning of 2009, and another 826,000 asylum seekers. More than half of the world's refugees are in Asia and another 22% are in Africa; both regions where many governments are ill-equipped, legally and economically, to handle the volumes of people requesting protection in their borders. The 59-year-old Office of the U.N. High Commissioner for Refugees (UNHCR) was designed to help Europeans dispersed during World War II return home in an orderly fashion. Now it's charged with aiding the millions who sweep the earth as they flee bloodshed, repression or poverty. "It was a simpler world out there," says Bill Frelick, director of Human Rights Watch's refugee-policy program, referring to the years between the end of World War II and the end of the Cold War. "It wasn't looking at messy, mixed reasons for [people] leaving." The world's humanitarian resolve, so evident after 1945, is weakening as governments throw up higher walls to both keep out economic migrants and ramp up security. In some countries with high influxes of refugees and those seeking asylum  such as Italy, Indonesia and Malaysia  nearly 90% of the population favors more stringent restrictions on immigration, according to a 2007 Pew Research Center poll. Many countries once willing to receive refugees  defined in the 1951 U.N. Convention Relating to the Status of Refugees as those running from persecution in their own nation because of race, religion, nationality or social or political affiliation  are no longer prepared or able to do so. Indeed, the very definition of refugee is no longer adequate for the vast ranks of those who are fleeing wretched or violent states but are driven, rather, by a desire to better themselves economically. Sheer pressure of numbers means that the sanctity of non-refoulement  the principle, enshrined in the convention, that a nation cannot forcibly send a person back to a homeland where they could face danger  is diminishing. More and more, genuine asylum seekers, along with those looking for work, are being pushed back to places they lost everything to leave, or are stuck in transit countries where legal protection for them is minimal. Once they're away from their home country, refugees can expect to wait. For most, finding a new home in a third country is a distant dream. No state is obligated to offer permanent homes to refugees in transit countries; in 2008, the UNHCR helped 88,000 people resettle out of the 10.5 million recognized refugees that it works with (and that doesn't count the many more whose applications for that legal status are pending). Though the 1951 Refugee Convention defines who deserves protection as a refugee and what their basic rights in other nations should be, it does not obligate states to take refugees in as their own citizens. Today, there are 30 spots across the globe where more than 25,000 people of the same nationality have been waiting for at least five years, according to the U.N. For many, it's been much longer: some of the 66,000 Eritreans living in camps in Sudan have been there since the 1960s, and in Algeria, refugees from the western Sahara have been stateless for over 30 years. In 1993, the average waiting time in "protracted situations," as the U.N. refers to them, was about nine years. By 2003, it was 15. As conflicts in the Middle East and parts of Africa deteriorate, says António Guterres, the U.N. High Commissioner for Refugees, "The time in asylum in many of these situations, unfortunately, becomes endless." 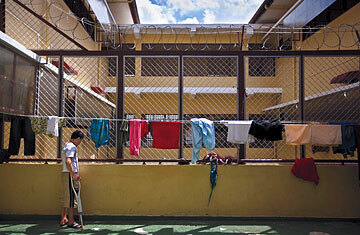 Read "Asylum Seekers Stuck in Indonesia-Australia Standoff." Watch TIME's video "Yemen a Dead End for Somali Refugees."